The marigold flower is one of the most common planted annuals in the world. The long lasting companion flowers with their bold odour can be used to attract pollinators to your garden in particular bees and butterflies. Each one of them is so easy to grow from seed except the mule Marigolds, the seeds are sterile. The marigold thrives in full sun and has to be grown in areas where there is afternoon shade in hot climates. They are not particular about the soil, but will grow well in well-draining soil. They will produce more flowers and less foliage if grown in soil that is not very rich. Marigolds are a vegetable gardeners favourite flower. There are quirky little marigolds out there, that come in fun bi-colours with bold stripes in deep burgundy and a bright shade of yellow, these are sure to brighten up your summer garden, these are called the court jester marigold. They will grow in most areas in Australia and are sure to give an impressive display, scattered around your garden. There are so many marigolds available that it can be very confusing and daunting to be able to choose one. The African or American Marigolds are the largest members of the marigold family and are herbaceous plants that belong to the sunflower family. The binomial name of the African marigold is Tagetes erecta. The marigold Tagetes or the African marigold belong to the Asteraceae family and the subfamily Asteroideae. They are upright annual and perennials that are known for its fragrant single coloured round blooms of yellow, golden, orange or white blooms. Their flowers are aromatic and ferny and bloom to a size of 4 to 6 cm in diameter. They display both ray and disc florets and are attractive because of its deep colours. The plant has dark green pinnate leaves. The African marigold has upright stems and can grow to a height of 2 to 3 feet tall. They produce daisy-like solitary, single or double flowers. The Marigold Tagetes patula are the French marigolds, they flower profusely, when in bloom the plants are literally packed full of flowers. These French marigolds are bushier plants, lower growers and have smaller flowers. The dark green bushy plants have round blooms. Raised from seed to produce attractive looking plants from 12 cm of up to 45 cm tall and a width of 30 cm. They often bloom in rich colours of orange, lemon gold yellow, reddish brown and creamy and lately white vanilla colours. This type of marigold are showy little plants and can be scattered in a home garden, or planted in the front of any other gardening plant. If you have rot-knot nematode damage sow the french marigolds as a cover crop this will treat that area naturally. Some current common varieties are fiesta, sparky, red Marietta, marigold tiger eyes, boy oh boy, double bonita mix, marigold honeycomb and there are so many more. Signet marigolds Tagetes tenuifolia, lemon gem has all golden single daisy flowers that have 5 petals and a small short clump of petals in the centre. Orange gem is the same shaped flower but flowers orange. Signet marigolds are the tasty edible and can be picked and eaten and used to decorate salads just like the marigold calendula. Growing signet marigolds give off a citrus smell and they make great container plants as well. They will grow for you at a mere 10 to 12 inches in height. Clear the garden bed and prepare the soil where you are looking to plant marigold plant. The soil has to be dug up to about 6 to 10 inches deep and then add organic matter to the soil. Add the dug out soil over the organic matter and cover it completely. Now dig a small hole about 4 to 5 inches deep in the prepared soil to place the marigold plant. Plant in spring. Take the seedlings form the punnet, each plant has to be placed 18 inches apart. The soil has to be well-draining one and must be in an area where the plant can get maximum sunlight. Ensure that the soil around the roots is firm and the plant is held firmly in the soil. Adding a teaspoon of organic fertiliser around the plant while planting will help in encouraging bloom. It is important to keep the soil moist after planting the marigold and hence water it for the first 10 to 12 days with care. Afterwards, you can water the plant once in a week or when the soil goes completely dry. Ensure that the soil is not soggy. The growing tips of the newly grown marigold have to be pinched twice or thrice before flowering in order to encourage more branches to develop. 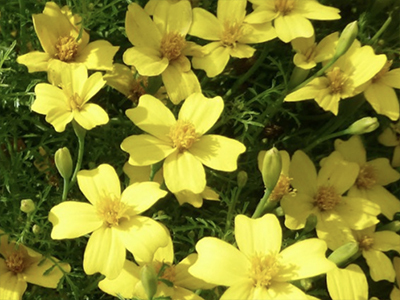 Propagating Marigold Tagetes Seeds you can plant them directly into the garden. It is best that you plant the seeds in early spring at a depth of 6mm or you can start the seeds earlier indoors. The seeds take one to two weeks to germinate and two months to flower after planting the seed. All these marigolds have to be deadheaded regularly in order to encourage regular blooming. Do not overwater the soil and the leaves and the flower as they get soggy and can also rot. The blossoms have to be cut off after it wilts or else the plant will set seeds and this will reduce its flowering. If you grow them well, the marigolds will blossom during the summer, autumn and the spring season. 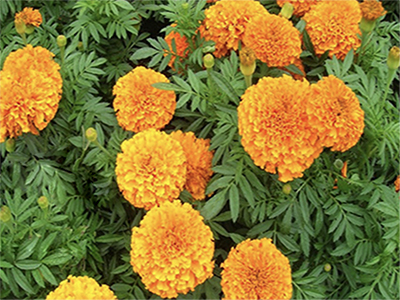 Marigolds of all types have become popular annuals in the vegetable garden as companion plants, many people plant them to stop bad insects, nematodes, cabbage worms, whitefly, aphids and many more. These plants lure the helpful and useful insects to the garden like lady birds, lacewings, praying mantis. This has been a fashionable practice for hundreds of years and still practiced today with plantings amongst tomatoes vegetables and flower gardens.